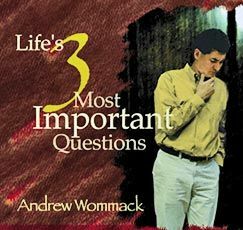 These three questions are the most important questions you will ever ask yourself. Most people have probably never written them down, but I guarantee you that every single person has pondered these in their heart and mind at some point in their life. The answers to these questions will absolutely determine what your life will become. So, it's important to answer them correctly. The answer to this question is by far the most important of all three in regards to your spiritual and emotional well-being. How do you determine who you are? Is it by performance, success, wealth, your job, your children; what is the standard? You may be surprised at the answer. The so called "mid life crisis"? never comes to those who understand this teaching.